With the popularity of mobile gaming on Android & IOS devices growing I thought it would be interesting to simply post my favorite IOS/Android App every week. To start off on this wonderful first week I have decided that Tiny Tower deserves the #1 spot. Tiny Tower is a sort-of casual RTS game. It has classic 8-bit graphics and nostalgic video game music. Not only is this your classic time-waster, but it has an addictive gameplay mechanic that keeps you coming back, constantly! 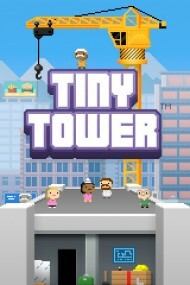 The main objective of this game is to build a “Tiny Tower”. You use money to build a new floor of your tower, and the type of floor is determined by choosing a category ranging from creative to residential. Everything you do to the tiny tower takes time; restock a restaurant, that will cost you 9 minutes, or 1 tower bux. Tower Bux are randomly rewarded for doing little tasks or finishing missions. Coins (money) are collected by the stores or restaurants in your tower. Tiny Tower is one of those games you find yourself playing whenever you have an extra minute or two. Whether its operating the elevator, restocking merchandise, or checking the latest Bitbook post (their version of Facebook) this masterpiece is sure to keep you busy! Tiny Tower is a Free App Available on the Android & IOS market places.